Damn, I jinxed it, didn’t I? It’s like when someone says “Don’t picture in your mind’s eye an enormous purple giraffe” and immediately your brain does just what it was told not to do, right? Sorry for that. But you’ve already watched the video and no doubt noticed Neymar’s positioning and how, despite being right in the thick of the action and with his body’s momentum carrying him in Cavani’s direction, he instead reverses course just as Cavani goes jogging toward the corner flag, heading over toward Mbappé rather than joining the goalscorer as is custom. Please, do not read too much into this. Do not think to yourself, Hmmmmmmmm, I’ve been hearing a lot about how Cavani and Neymar are currently in the midst of a battle of egos, with both men fighting for top dog status in the form of who gets to take PSG’s penalties and free kicks, and with rumors that this rift has fractured the locker room. Does this odd moment basically confirm the stories? 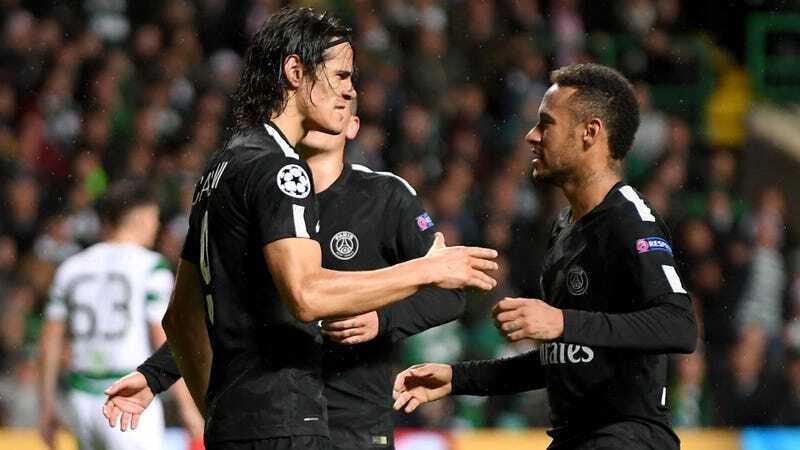 Do Neymar and Cavani really hate each other’s guts? And if the relationship is already so deteriorated that the two teammates don’t even want to celebrate each other’s goals, does this mean things are likely only to get worse and worse until Ligue 1 has its equivalent of the Shaq-Kobe beef? Again, those are thoughts you should not be thinking. That would be an overreaction. It is much more likely that this was a total, complete accident, or that Neymar just really appreciated Mbappé’s pass and wanted to let him know that, or some other innocuous explanation that doesn’t involve impressive levels of pettiness. So don’t believe otherwise, okay?